This popular temple is unusual in several ways. 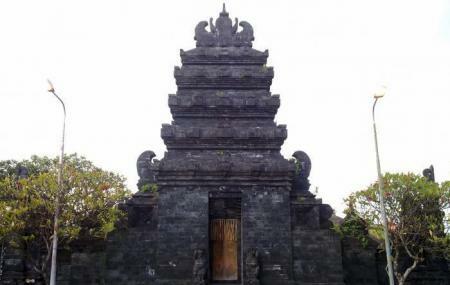 Firstly, it faces east rather than the south like the other temples of Bali. The building you see today dates from the 18th century; and it is claimed that there used to be an older temple here as far back as the 11th century. And it is the traditions of this older temple that is followed by the devotees here today. The temple has only two courtyards instead of 3. And while most of the eleven-tiered in such Bali temples are there for decoration purposes, this one seems to have been made for purposes of intimidation and majesty. The temple is dedicated to the prosperity of wet and dry rice paddies. Sometimes farmers come to the temple to bring back holy water to their own rice paddies, with it is thought their holy influence will control the presence of pests such as mice and insects. The best time to visit the temple is during a holiday. There is a market nearby that you can check out before or after your visit to the temple. Go to the temple is open at all times for worshippers. visiting hours may be restricted. How popular is Pura Ulun Siwi? People normally club together Kemenuh Butterfly Park and Gianyar Street Night Market while planning their visit to Pura Ulun Siwi. Pura ulun siwi menyimpan keunikan tersendiri...pelinggih/tempat pemujaan Sang Hyang Widhi dg manisfestasinya di fisualkan dg batu2 besar yg bersejarah..
Lokasi Pura diatas tanah yang cukup tinggi, cocok sekali sebagai linggih Ida Bethara.